EWiF aims to balance out the ratio of men to women in the franchise industry! Our members have access to a range of services and portals to gain advice and support. We hold events throughout the year including an Awards Ceremony and a National Conference to give our members the chance to come together, network and share their ideas. 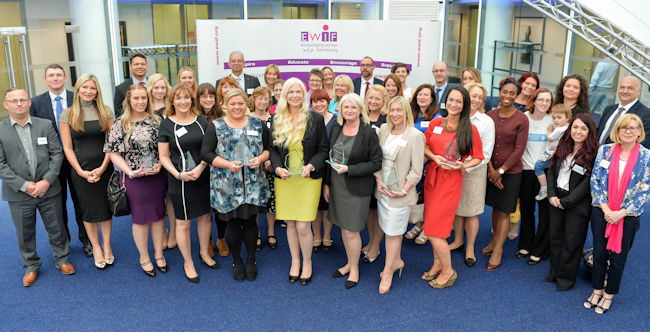 We host an annual awards ceremony to not only recognise the achievements of women in franchising, but to boost the winners position and give them more credibility in their industry. So many of our winners don’t even realise that the work they do is outstanding because it’s just everyday life to them. Our awards help them to celebrate their achievements and recognise how successful they are on a day-to-day basis. In addition, our National Conference gives our members another opportunity to join together and share their ideas and successes. We invite a range of guest speakers every year to inspire our members and give them practical advice they can take away to use in their own businesses and daily lives. The EWIF awards and our National Conference are fantastic ways to help women come together and celebrate and recognise both their own and each other’s achievements. Many of our award winners and nominees dedicate their working lives to supporting others in their businesses and we want them to be celebrated and recognised for this. By recognising the achievements of so many women within their businesses, we help to encourage more women into the franchise industry. A recent NatWest/BFA survey revealed that over the last two years, only 17% of new franchisees have been women. In addition to being able to attend so many great events, being a member of EWiF opens the doors to networking with some of the biggest brands in the franchise industry as well as some of the smallest. Many businesses grow through networking and gain advice from those business owners who are experiencing exactly the same challenges. For those looking to take their first steps into the franchise sector as either a franchisee or franchisor, attending EWiF meetings and conferences is a great introduction and a way to speak to those already in the industry. We are a not-for-profit organisation run entirely by volunteers, so to find out more about becoming an EWiF member visit our website and learn more about us.